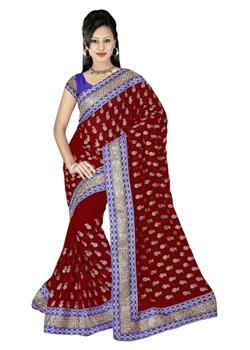 Red and yellow cotton lahenga style saree with fabulous embroidery. The lower part of the pleats is decorated with floral thread work and golden needlework along with orange border with green piping. Pallu of the saree is decorated with the attractive appliqué floral black border with zari and thread work. Comes with unstitched matching blouse fabric.